I am training for my first full marathon. I will be running the California International Marathon here in Sacramento this December. With the added stress of training and miles on my feet, I developed knee pain when running. This is never a good thing. Pain is no fun. Knee pain for a runner is a bad word. Discussing my knee pain with friends at the gym, a new trainer named Christian at the Elk Grove California Family Fitness facility, eagerly chimed in some words of advice to help. He suggested (and confirmed) that the knee pain I was experiencing could in fact be from a tight IT band. He brought over one of the gym’s large foam rollers and gave a great demonstration on multiple ways to use a foam roller! He was very helpful and thorough. The past few weeks, I have made sure that I take advantage of stretching and foam rolling my pain away. It adds just a few extra minutes to my workout, but the added flexibility and massage to my tired muscles are much appreciated. Stretching is important. 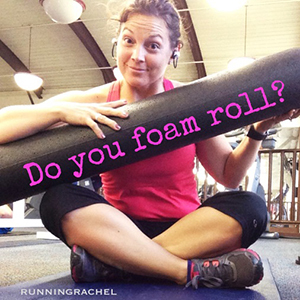 Foam rolling is important. As a member, I am thankful to have a foam roller at my disposal when visiting California Family Fitness. I don’t have to purchase a bulky piece of equipment to store at my house; I can just use the many sizes and styles of foam rollers at the gym. I am also thankful that I have the expertise and helpful guidance from trainers to help teach and guide me to be on the road to running pain free!